On 3rd May 2018, the Northamptonshire Footwear Manufacturers Dinner was held at the Marriott Hotel in Northampton, hosted by Barker Shoes. 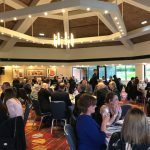 The guest speaker on the night was Paul Griffiths, Chief Executive at the Northampton and Milton Keynes Chamber of Commerce. This key sector in our industry continues to flourish and the positive atmosphere and friendship that is typical of the industry was evident throughout the evening. This year we welcomed 87 guests from Northamptonshire companies Airwair, NPS, Sanders & Sanders, Trickers, Church, Crockett and Jones, Grenson, Cheaney, Loake, Springline, The British Footwear Association and hosts Barker Shoes. We look forward to the 2019 Annual Dinner hosted by the BFA in celebration of their 120th Anniversary.